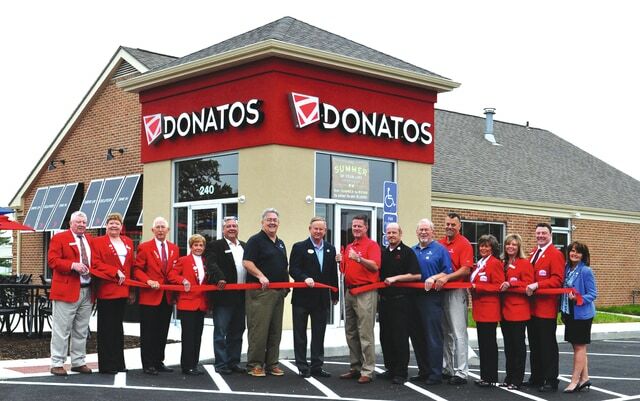 FAIRBORN — Donatos Pizza has opened a new location at 240 E. Dayton-Yellow Springs Road, formerly occupied by Fifth Third Bank, that features a 68-seat dining room, drive-up window, and a 450 square-foot patio for outside dining. The renovated facility is just east of the Five Points intersection. “Donatos has been committed to the Fairborn community since we opened on Broad Street in 1994,” said store owner Todd Rogers. “Our new location will allow us to provide even better service to all our friends in Fairborn as they enjoy their favorite pizzas, subs, salads and wings,” he added. The phone number for the new restaurant remains the same as the former Broad Street location: 937-879-7000. Its hours on Sunday through Thursday go from 11 a.m. to 11 p.m. with closing time extended to midnight on Friday and Saturday.